As a former professional dancer the current retrospective Dance & Fashion on view at The Museum at FIT is one that’s very close to my heart. The exhibition is a stunning exploration of the relationship between these two embodied art forms. Organized by the museum’s director, Dr. Valerie Steele, and set in a dramatic mise-en-scène created by architect Kim Ackert, Dance & Fashion features nearly 100 dance costumes and dance-inspired fashions, ranging from the 19th century to the present, many of which have never been exhibited. Dance & Fashion opens with a display of ballet costumes and related fashions from the 1830s and 1840s, the era of the Romantic ballet. A rare Spanish-style costume worn by the great ballerina, Fanny Elssler, is accompanied by fashions of the period. A costume by Christian Bérard for Symphonie Fantastique, along with a costume by Mme Karinska for Ballet Imperial, demonstrates the evolution of classic ballet costume, while a costume from Creole Giselle for the Dance Theater of Harlem evokes the continuing appeal of the Romantic ballet. Christian Dior’s Black Swan ball gown epitomizes ballet’s influence on fashion design. Conversely, Marc Happel, costume director of New York City Ballet, has said that his costumes for Symphony in C were inspired by fashions designed by Dior and Balenciaga. Designer’s Christian Louboutin and Noritaka Tatehana have juxtaposed ballet pointe shoes, worn by famous dancers such as Anna Pavlova and Margot Fonteyn into fashion footwear. The Orientalism of the Ballets Russes (1909-29) has also influenced generations of fashion designers, from Paul Poiret to Yves Saint Laurent. A costume from Schéhérazade, 1910, designed by the artist Léon Bakst and recently acquired by The Museum at FIT, is the centerpiece in a display of extraordinary fashions and costumes, including a couture ensemble from Yves Saint Laurent’s 1976 Ballets Russes collection and an ensemble by Ungaro worn by Princess Caroline of Monaco. There are also costumes worn by dancers such as Rudolf Nureyev and Mikhail Baryshnikov. 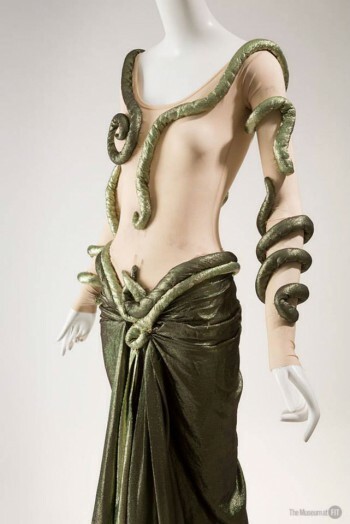 Among the fashion designers who have created costumes for the ballet are Yves Saint Laurent and Riccardo Tischi of Givenchy (for the Paris Opera Ballet), Christian Lacroix, and Jean Paul Gaultier, plus Valantino Garavani, Prabal Gurung, Giles Mendel, Olivier Theyskens, Rodarte, and Iris Van Herpen, all of who have created costumes for New York City Ballet. For the modern dance section, the Martha Graham Dance Company has loaned noteworthy dresses, some designed and worn by Graham herself, and others the product of a close collaboration between Halston and Graham. Dance & Fashion also includes several important African-Caribbean-inspired costumes from Katherine Dunham, a costume from José Limon’s Moor’s Pavane, and one from Alvin Ailey’s Revelations. Fashion designers featured who have created costumes for modern dance include Narciso Rodriguez for Morphoses, Francisco Costa for Elisa Monte, and Tara Subkoff for Stephen Petronio, among others. 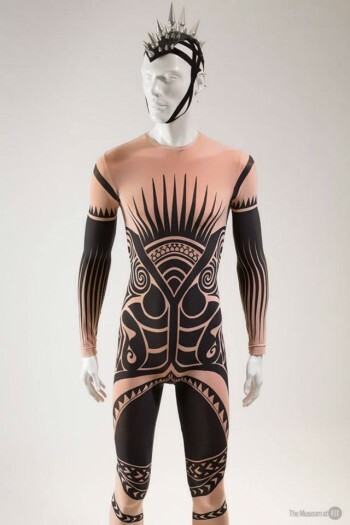 A highlight is a costume from Merce Cunningham’s Scenario designed by Rei Kawakubo of Comme des Garçons, juxtaposed with a CDG “bump” dress, which inspired the dance costume. In addition to ballet and modern dance, there is a flamenco dress and a selection of flamenco-inspired dresses by designers such as Cristobal Balenciaga, Elsa Schiaparelli, Jeanne Paquin, Oscar de la Renta, and Ralph Lauren. Designs worn by step dancers at a recent, Rick Owens runway show in Paris will also be on display.